There is a cost for an investment company to operate a mutual funds and ETFs. It includes the manager’s fees, administrative costs, compliance, trading costs, 12b-1 fees (sales fee for the company who sold you the fund) and advertising. The expense ratio is a percentage that directly lowers the return to a fund’s investors. The expense ratio is a very critical number when comparing investments. Some investments types will have a higher expense ratio others are just too expensive. 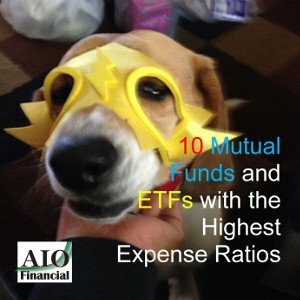 Here are the ETFs and Mutual Funds with the highest expense ratios. Our search for mutual funds only included A shares. There are different share classes, some depend on the type of compensation the person who sold you the fund is getting (this may not affect you if you use no load funds or have a fee only financial planner) and the amount you invest. Some companies, like Vanguard, offer a lower expense if you invest a certain amount (for example $10,000). We are just looking at A shares. I appreciate any feedback for our AIO Financial blog. Please contact me if you have any comments, questions, and suggestions. You can comment here or contact me through Facebook, Twitter, email (bill@aiofinancial.com), or call 520-325-0769.